Now that the USA Furlough 2013 is officially over, those crafty mischief makers [engineers] over at NASA are at it again. This time, "it" doesn't mean wasting billions of taxpayer dollars on space debris. Well, I mean, it probably does--being a government program and all that. 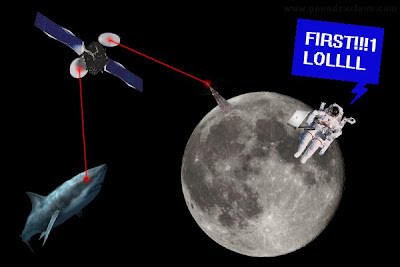 They've figured out how to get broadband internet on the moon. That's something useful, since man has never been to the moon. You see, I recently watched a history documentary revealing that the moon landing was faked to put an end to the space race and declare USA supreme over all other countries. Written by Arthur C Clarke and directed by Stanley Kubrick, the 1969 USA moon landing was an elaborate hoax to fool Americans (and Russians). No original video tapes still exist. So try disproving history with your no evidence. Even if you "believe" that "we" did, in fact, "land on" the "moon;" the last alleged moonwalk was, like 41 years ago. Which means that the computers on the moon probably don't even have an ethernet port, let alone wi-fi. For the sake of this article, let us suspend our disbelief. Let us say that at some point in the future there will once again be Americans on the moon and that they will have their laptops and will want to check their facebook feed. How will this be possible? With lasers and math. See kids, education can pay off in really cool ways! A NASA intern was playing around with laser pointers trying to blind terrestrial pilots and then had a really good idea and told it to his mentor who promptly stole the idea and told it to the head of NASA who also thought it was really great and got a sweet award and a salary raise and the admiration of all of his or her peers. Really, though, with lasers. Using a carefully calibrated laser pointed at a space probe, the scientists proved they could achieve high speed internet in space. Current methods for communicating with astronauts still involve radio transmission, which is slooow and junk. A laser connection would ensure quick, clear, and reliable communication with peoples in space. The space probe used for these tests is called LADEE and on board is Lunar Laser Communication Demonstration. It achieved internet speeds of 622 Mbps down and 20 Mbps up. Jealous? Yeah. Point a laser at my space probe, NASA. Bring this technology to the masses. I wonder what Time Warner Cable would charge for a laser connection. Their current top speed in this area is 50 Mbps and it costs $75/mo. The rest of the nation is probably pretty similar (except where there is Google Fiber!). I forget what I was going to say now...something about high prices and low speeds or whatever. But yeah.